The Orlando SunRays won nine games in extra innings in 1990. Reed Olmstead knocked in the winning runs in five of those games, The Orlando Sentinel wrote. The fifth came in Game 2 of the Southern League Championship Series, a 12th-inning, two-out single. "I am numb. What an incredible game," SunRays manager Ron Gardenhire told The Sentinel after that playoff win. "You have your Mr. Octobers, your Joe Clutches, but Reed is Mr. Extra Inning." Olmstead was only two seasons removed from being released by the Cardinals out of single-A. But, there he was with the Twins system at AA Orlando in 1990. Olmstead hit .266 that year, with eight home runs and 65 RBIs. But his first full year at that level was also his last. 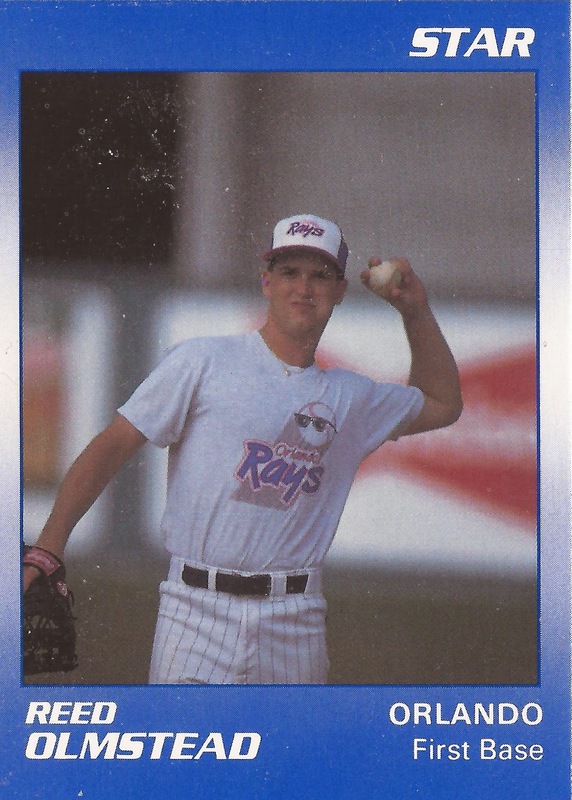 Olmstead played just one more season in affiliated ball, in 1991. He returned for two seasons, years later in independent ball, testing out a pitching arm he'd left behind in high school, but he never made the majors. Olmstead's career began in 1986, taken by the Cardinals in the second round out of Blair High School in California. At Blair that year, Olmstead earned player of the year honors. The Los Angeles Times called Olmstead that year "one of the most versatile players in the valley." At the plate, Olmstead hit .516. On the mound, he posted a 1.13 ERA. Olmstead played his first year as a pro with rookie Johnson City, as a first baseman. He hit .255 with four home runs. He moved to single-A Savannah for 1987 and short-season Erie. Between them, he hit .208. It was Savannah full time in 1988, still hitting .228 with four home runs. One of those home runs came in late August in a loss to Charleston. It was also his last year with the Cardinals. For 1989, he signed with the Phillies, sent to single-A Spartanburg. He hit .238 with seven home runs. Still, he was considered a prospect, The Philadelphia Inquirer wrote, taken by the Twins that December in the minor league draft. With the Twins, Olmstead made AA for the first time, at Orlando. In July, Gardenhire looked to a future where Olmstead would make the majors. "He's a left-handed hitting first baseman, and with the short right field in Minnesota (Metrodome), we were looking for a first baseman who could drive the ball," Gardenhire told The Sentinel. "He's been outstanding for us. Coming out of spring training, I didn't know how he would handle the pitching." By June 1991, though, Olmstead was out of the Twins organization, given his release after batting just .196 in 38 games. He then signed on with the Astros at high-A Osceola, ending his affiliated career. Olmstead, though, returned half a decade later, in 1996. He also returned as a pitcher. Signing on with independent Thunder Bay, Olmstead went 2-2 in 12 outings. He returned to being a position player in 1997, at Regina. It was his final year as a pro.